Hastings United manager Chris Agutter says ‘everything is on the up’ as the promotion-chasing football club heads into the final third of the season. With 12 matches remaining, Hastings sit third in the Bostik League South East Division and the teams placed second to fifth at the end of the campaign will go into the play-offs. 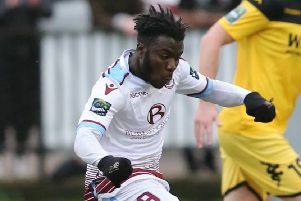 Hastings are two points behind second-placed Ashford United and eight ahead of sixth-placed Whyteleafe. Agutter said: “I think we’re in a good place at the minute, we’re definitely on an upward curve. There’s been games this season we’ve won and I’ve felt less positive than I do now. The mood in the camp is great. “I think it’s a time for everybody to be really excited. Everything’s on the up, we’ve just got to make sure we see it through to the end of the season with no regrets. “Every game we have scouts from pro clubs come and watch. Across the board we’ve got good footballers. Hastings’ two matches over the past week - at home to Guernsey on Saturday and away to Horsham on Tuesday - both ended in 1-1 draws. Although winless in three matches, Hastings have lost just one of their last nine games and sit third in the form table for the last 10 encounters. Their resources will be extremely stretched, however, for the trip to Whitstable Town today (Saturday). An entire team’s worth of players are either suspended, injured or trying to shake off an injury as Hastings prepare to face a 15th-placed Whitstable side without a win in its last six outings. Ollie Black and Jack Dixon are banned, while Lanre Azeez and Hassan Ibrahiym are likely to remain sidelined for another couple of weeks. Sam Cruttwell missed the midweek Horsham game with a badly bruised foot, Jordy Mongoy came off injured in the same game and Sam Adams also picked up a knock. Jahmal Howlett-Mundle has been battling a knee injury for several weeks and Temi Eweka is also struggling. Sam Beale is still out, but Davide Rodari is just over a week from being available for selection. “Our approach won’t change,” continued Agutter. “We’ll go there to do what we do and do our best to keep the scoreboard ticking over. “The game will be what we make it. We need to go down there and make it abundantly clear we’re the team that’s challenging for promotion and establish our style on the game by having the ball and keeping the ball. Former Hastings forward Peter Heritage has this week joined the coaching staff at The Pilot Field. “I’ve known Pete since our Sidley days and I just felt it was a good move,” Agutter added. “We really lack experience this time of year, whereas Pete has been there and done it.